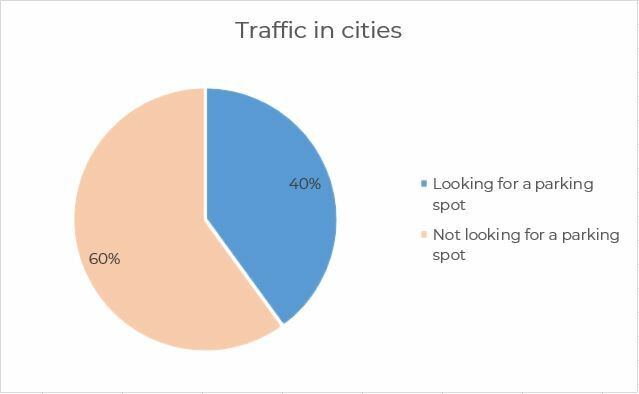 Did you know that in cities the people that are looking for a parking spot account for 30-40% of the total traffic? This not only causes frustration amongst drivers, but also results in a increase of congestion. Furthermore, it reduces road safety. When congestions arise, it results in the drivers spending more time than necessary on getting to their destination. This is a problem. Think about the enormous amounts of greenhouse gasses that could be saved if people would be able to spare the time of looking for a parking spot. Luckily, there is a solution: Parkeagle’s smart parking sensors. The solution to reducing congestion is using Parkeagle’s smart parking solutions, where sensors detect whether parking spots are occupied or not. Consequently, this intelligent sensor solution will lead drivers straight to a free parking spot in their area of destination. The sensors are connected to the Parkeagle app, which gives users real-time insights on the occupancy of a parking bay. This means that you as a driver, will not have to spend time and gas when looking to find a parking spot. Simply navigate to an unoccupied parking bay using the Parkeagle app. In a nutshell, the Parkeagle parking space sensors are not only an advantage to drivers looking for parking spots but also to the environment. The use of smart parking sensors can significantly improve the flow of traffic in urban areas. This will make sure that the city streets will not only become safer, but also less polluted. The use of smart parking bay sensors has an advantage for everyone. Highly populated cities have to deal with a huge amount of traffic every day. This also means that they need to provide citizens with a sufficient amount of parking possibilities. However, the searching for parking spaces in a busy city can be a great pain for drivers, even though there might be enough. This is where Parkeagle’s smart parking space sensors can make the difference. Our app indicates which spots are unoccupied and relieves the drivers of their pains when needing to find a parking spot. Parking in the garage of a crowded shopping center can be a big challenge. Some shopping centers already offer a lighting system to see what parking bays are occupied or not. However, this technology as of yet, is not very accurate. The solution: navigating your customers towards a free spot by utilizing the Parkeagle technology will guarantee you reliable data, resulting in a higher rate of satisfaction for shopping centers and most importantly, their customers. Interested in Parkeagle and our solutions? Make sure to contact us, we are happy to help! Success! Please confirm your subscription via E-mail. What are the benefits of smart parking for drivers? How to stay up to date with the Parking Industry?